Another bath fixture series I last saw as a prototype is the Charlotte from Brizo. As fond as I am by the RSVP, also by Brizo, the lines of it are a bit too Art Nouveau, a bit too heavily influenced by the Erte illustration that begat them. I think the RSVP is drop dead gorgeous, but the RSVP dictates the room it's surrounded by and that's fine if you have a home built during the 1930s, but there has to be a way to bring some of that glamour into a bath that's not in a vintage home. Enter Charlotte. Charlotte is a full line of fixtures and accessories that are available in the Chrome, Brushed Nickel, Polished Nickel and my favorite, Cocoa Bronze with Chrome highlights. This is a fixture series that can play into a vintage setting, but at the same time, they can play well in more modern baths. If you're in the market for new bath fixtures, give a thought to Brizo. You can see the rest of their fixtures on their website. Thanks Donna, I think she likes you too! 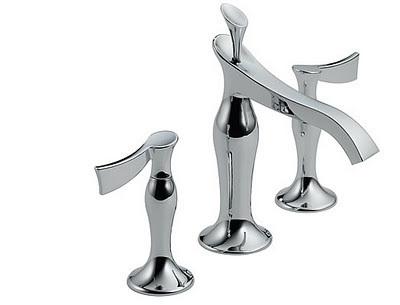 Reader question: whither goest farm sinks?